Emma Baulch is Associate Professor of Media and Communication at Monash University, Malaysia. She received her PhD from Monash University, Australia and has held academic positions at Leiden University, The Australian National University and Queensland University of Technology. She is a member of the editorial board for the Vernacular Indonesia series, Monash University Press. 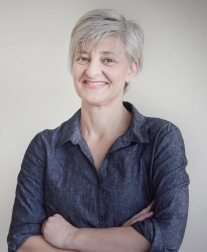 Dr Baulch has worked with a range of external organisations over the course of her career, including the Australia-Indonesia Centre, the Indonesian National Planning Board, the National Film and Sound Archive, TRUE Relationships Queensland and the Australian Federation of AIDS Organisations. Dr Emma Baulch is an Associate Professor of Media and Communications at Monash university Malaysia. Her research examines Indonesian media and popular culture from the perspective of everyday life, with a specific focus on how media technologies shape social life. Her PhD was a study of the role electric guitars played in shaping communities of amateur musicians in Bali in the late-1990s, published by Duke University Press in 2007 as Making Scenes: Death metal, Punk and Reggae in 1990s’ Bali. Her postdoctoral work examined how television and digital technologies influence the formation of pop music genres, and is forthcoming as a book, titled Genre Publics: Pop, Technologies and Class in Indonesia with Wesleyan University Press. Her current research examines digital infrastructures and everyday life in Southeast Asia. In 2017, with Jerry Watkins and Amina Tariq, she co-edited mHealth innovation in Asia: Grassroots Challenges and Practical Interventions (Springer). The collection, Digital Transactions in Asia (Routledge), co-edited with Adrian Athique, is currently in press. She is on the editorial board of the Vernacular Indonesia series at Monash University Press. “Celebrating Everyday Life in Australia-Indonesia Neighbourhood”, Australia-Indonesia Centre Tactical Research Projects grant (2017). The project investigated and imagined a possible scenario where an increasing number of people of Australia and Indonesia enjoy significantly intimate and productive engagements. A team of three investigators worked in three cities across the archipelago to interview Indonesians with experience of living in Australia. The project produced recommendations for specific steps to be taken for strengthening Australia-Indonesia friendship. “Mobile Indonesians: social differentiation and digital literacies in the 21st century”, ARC Discovery 2013-18. ‘Mobile Indonesians’ was a multi-sited ethnographic study of the role of mobile telephony in cultural change. Its execution has been enfolded into a broader research program of my VC Research Fellowship at QUT. The research team created detailed qualitative maps of the changing social networks and communication behaviours of two user groups: pop fans and community health workers. This innovative research method allowed us to understand the complexity of mobile telephony’s impact on rapidly evolving digital literacies and patterns of social differentiation. “Middle Classes, New Media and Indie Networks in Post-Authoritarian Indonesia”, Australian Research Council Post-Doctoral Fellowship (2009-2012). The project documented and critically analysed the activities of a digitally-equipped generation of urban middle class Indonesians in shaping public culture. It focused on 'indie' (for independent) networks, sites of the production and consumption of films and music that make intensive use of new media technologies. The project was the first in depth study of the wider socio-political significance of the boom in self-produced media in Indonesia at a time when post-authoritarianism and the digital age coincided. Dr Emma Baulch is the coordinator for the Communications major at Monash Malaysia. She co-ordinates three units: a first-year gateway unit (Media Studies, AMU1277), a third year capstone unit (Reading social media: socio-technological literacies, AMU3449), and a unit within the Master of Communications (Contemporary issues in Asia (AMG 5382). Areas of research and supervision include Asian popular culture, popular music and everyday uses of digital media.